At Orgatec 2018 in Cologne, Interstuhl is exploring the meaning behind the well-known company slogan ENJOY SEATING PERFORMANCE in greater depth, visually elevating it to the third dimension. Why a third dimension? What does the number three stand for? The number three stands for three-dimensionality - and thus embodies Interstuhl's current driving forces - and what is visible and liveable on about 1400m² exhibition space at Orgatec in Cologne. Body, mind and soul - these are the three words that sum up Interstuhl's Active Sitting Solutions. This overall system derives from two key insights: Firstly, that those who want to look after their health, boost their productivity and consequently enjoy their work need to strike a balance between sitting and moving. Secondly, those who want to facilitate active sitting need to think about far more than just seating solutions - they need to focus on the human body as a whole and look at the way in which it works. FLEXTECH increases the radius of activity for the chair user, expanding their range of movement options while sitting. A flexible cone in the chair mechanism enables the chair to become mobile in all directions. The swivel chair collections AIMIS1, EVERYIS1, GOAL, YOSTERIS3, MOVYIS3 and JOYCEIS3are now available with "FLEXTECH inside". With PUREIS3, Interstuhl is leading us into a new era of active sitting. The ultra-innovative swivel chair supports the user's movements in all directions. This 360-degree manoeuvrability is all down to a new and unique material. The special composition of polyamide and glass fibre has been meticulously developed and extensively tested by Interstuhl. The outcome: The PUREIS3 is a dynamic and agile chair that adapts intuitively to anyone who sits on it. Not only the automatically active sitting solution makes PUREIS3 a milestone in the evolution of sitting. Its absence of a mechanism and further adjustments as well as its intelligent materiality make it an all-rounder that is suitable for everyone and every situation - and immediately "sittable". In collaboration with Garmin, Interstuhl has developed the S 4.0 seat sensor, which records the user's sitting habits and forwards this information to an app. This gives the user a clear picture of whether they are moving enough and in a well-balanced way. The app also contains helpful "office workouts". The Sit-Life-Balance training is a programm that Interstuhl has developed with sports scientists especially for businesses and opinion leaders, with the aim of understanding and internalising all aspects of sitting. In 12 comprehensive training units, participants learn about the ERGO philosophy (healthy backrest, nutrition, stressmanagement), tips for keeping moving, specific seat settings and how to use the sensor. The exercises linked to the training units can be easily incorporated into everyday sitting and performed in any working environment. This didactic concept is a new solution for occupational health management in companies. With its Active Sitting Solutions, Interstuhl brings body, mind and soul into line with a holistic and sustainable approach to moving while sitting. 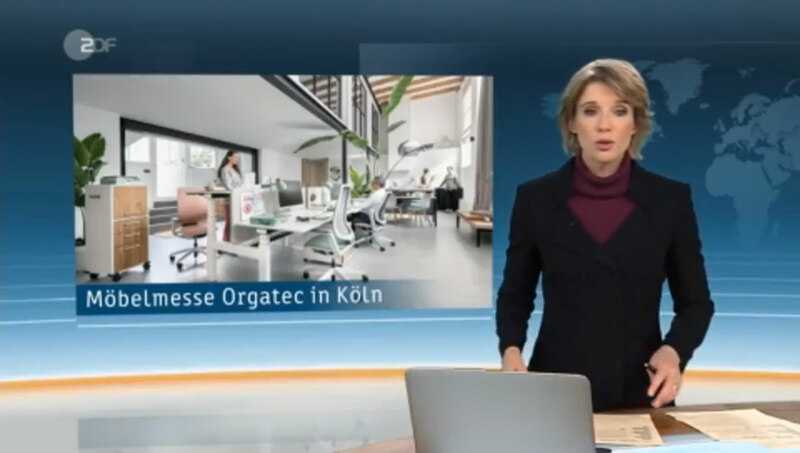 At Orgatec, the leading exhibition for the office furniture sector, Interstuhl is introducing its new area of expertise - SPLACES - for the first time. From now on, the seating specialist will categorize its entire portfolio in room scenarios - the so-called SPLACES. Interstuhl has been the innovative driving force behind professional seating at the workplace, and is now in this context expanding its portfolio to include versatile solutions for inspiring, pro-movement office landscapes: Space-defining structures and flexible furniture for discussion zones, combined with quiet areas for focussed work, are the hallmarks of this new stage of Interstuhl's evolution. At Orgatec you can explore the new system which will mark a start in a new era. Some of these new system solutions can be experienced at Orgatec. These include the new products LEMONIS5 & LIMEIS5. With this harmonising duo of club chair and bar stool, a wide variety of communication zones can be redesigned. These products are the start of a new era for Interstuhl as prospective supplier of integrated room solutions.